1997 marks a turning point in de Bruijn’s career, as new plans were made. Peter and Lotta decided to start developing their own kart and run their own team in the following racing season. The main goal was to have more control on racing activities and the development of the equipment. 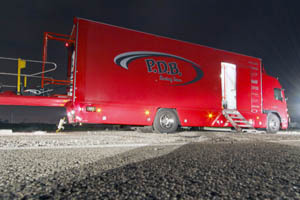 The long business relationship with Tim Gillard persuaded the two to come to an agreement for the development and production of his chassis for the PDB racing team. 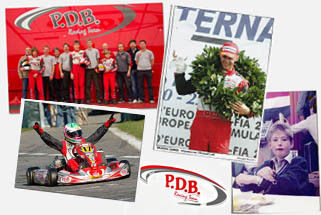 Newly set-up PDB Kartracing BV took over responsibility of all the sales of Gillard products all over the world, with exception of the UK, making the company sales grow year in year out and Peter De Bruijn (P.D.B.) 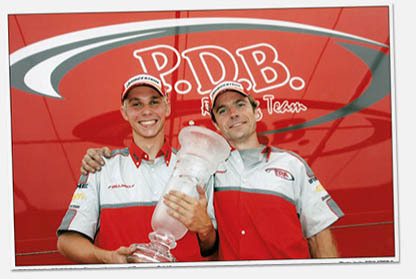 Racing Team was established at the end of 1997. P.D.B. Racing Team used Gillard chassis, Rotax engines and Bridgestone tires. 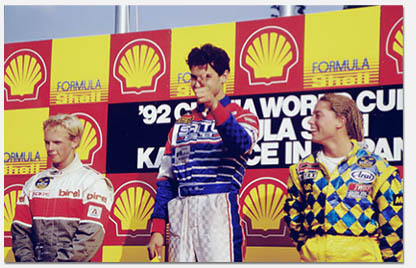 The drivers chosen for 1998 season in FSA class were Kimi Raikkonen, who performed well the previous year in FA, Lotta Hellberg, at her last season, and Charrel Zwolsman. In FA class, the P.D.B. Racing Team colours were defended by Ross Zwolsman and Benjamin van den Wakker. In its inaugural season, the team did really well: Kimi finished 2nd overall in the European Championship and 1st in the Scandinavian and Finnish Championships, while Benjamin van den Wakker won the Italian Grand Prix and finished 4th in the European Championship. In 1999, Lotta Hellberg retired as driver and took on the position of team manager. This way Peter concentrated exclusively on the technical side of the organization. A change of equipment was made in 1999: Parilla was chosen as new engine supplier. Oskari Heikinnen from Finland replaced Raikkonen in FSA, and two new drivers were chosen in FA: Nicke Petersson from Sweden, and Nicky Pastorelli, who won the Dutch Championship and finished 3rd in the European Championship in ICA the previous year. In the Junior class, de Bruijn selected four new stars: Marco Asmer from Estonia, Carlo van Dam, Bas Lammers and Nick de Bruijn from Holland. 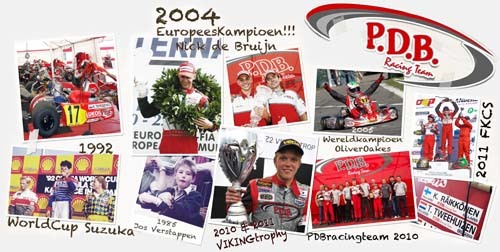 The first big success for PDB Racing Team arrived with Carlo van Dam winning the European FA Championship in 2001. Since then, important results year in year out: the 2004 European Championship title with Nick de Bruijn; the 2005 World FA Champion with Oliver Oakes; new star Michael Christensen winning the European Junior Championship in 2005, and vice European FA Championship in 2006. In 2007 Tommy Grice took the vice European KF3 Championship title, and Michael Christensen finished 3rd in the European KF1 Championship. Truly a brilliant result, considering it was the first year that the new KF engine was run. In 2008, more results are to be added to PDB long list of success. French driver Manuel Renaudie ended PDB season with a brilliant 3rd place in the Asia-Pacific KF1 Championship, after finishing 4th overall in the WSK in KZ2 where he grabbed 3rd twice. He also finished 8th overall in the European KZ1 Championship. British driver Jack Hawksworth took a brilliant 2nd and 3rd in the European KZ2 Championship ending 7th overall, Leopold Ringbom finished 2nd in the Viking Trophy for KF2 and 7th in the World Cup for KF2, and Tom Grice won the European KF2 Championship Western Qualification.